Die Kinder der Schule Podstawowa nr4 in Elk waren auch 2016 wieder mit dabei! 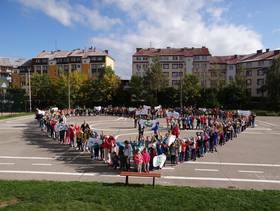 Dieses Jahr haben 371 Kinder zwischen 6 und 9 zusammen 5461 Grüne Meilen gesammelt. Ökologie an die Spitze! - das war der Slogan für ihre Aktivitäten. Wieder haben sie sich mit uns auf die symbolische Reise zur Klimakonferenz begeben, dieses Jahr nach Marokko. Ziel ihrer Projektwoche war es allen klar zu machen wie wichtig es ist auf unsere Umwelt zu achten und was jeder Einzelne zu ihrem Schutz beitragen kann. Dieses Jahr spielten die Jüngsten die größte Rolle. Zum Erstaunen der LehrerInnen veränderten sie viele ihrer Verhaltensweisen. So weigerten sie sich z.B. in Autos zu steigen, in denen weniger als 2 Personen mitfuhren und haben so das Elterntaxi ganz schnell durch gesündere und umweltfreundlichere Transportmöglichkeiten wie Laufen und Fahrrad fahren eingetauscht. During the campaign it was possible to join the beneficial and pleasurable things – for every ecological route our students got the foot print stickers, they were awarded for the commitment and involvement in ecological issues. Another possibility was drawing the blue bulb if the child had been taking care of saving electricity or drawing an apple if the child gave up on junk food like crisps, artificial drink as well as sweets. The number of apples or bulbs had the same scoring as the number of feet. Our students very scrupulously had been making effort to improve this project and they became the role models for their parents and protectors. This school year the educators of the youngest classes conducted the conversations about the way of getting back home and about their physical activity. The students also were “Detectives on the roads” – on 22nd of September as well as during the weekend they looked for dangerous places in our neighborhoods. The students noticed many places where the adults should take care of. The older classes are going to prepare a map of such places, just to let the local authorities know what they should keep an eye on. This year’s outcome is 5461 feet, so it’s 5461 kilometers. Hurray, we got through to Morocco and even further!